A group of students at UNIST has won the first place at the Hyundai Motor Group Hackathon: Hack a Road 2017. 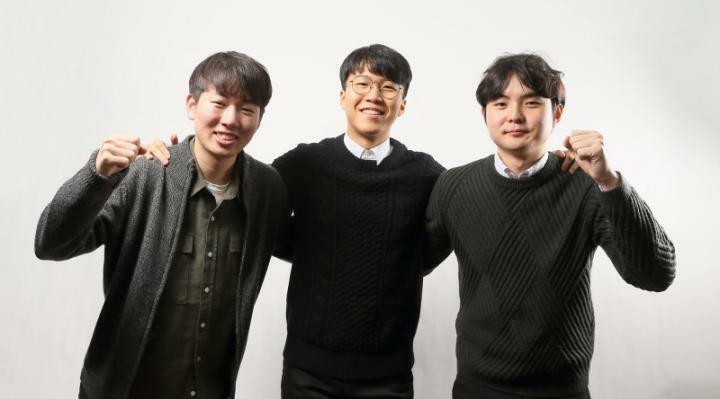 June Seok Kim, YoungRyeul Kim, and Jae Hwi Jung in the School of Mechanical, Aerospace and Nuclear Engineering are among 8 finalist teams partook in this year's Hackathon competition. The Hyundai Motor Group Hackathon: Hack a Road is the future mobility idea competition, hosted by Hyundai Motor Group since September, 2016. Its aim is to recognize and encourage outstanding achievement in the automotive and mobility areas, such as connected car technologies and services. The first place prize consists of $10,000 plus an opportunity to work at Hyndai Motor Company. On September 27, the 40 shortlisted teams were selected from nearly 264 entries from teams across the nation for the competition. At the main competition, held on November 8, each participating team competed for the 24-hour software development. The final evaluation took place on November 17 and only 8 teams were selected to compete in the final. This year marks the 2nd Hyndai Motor Group Hackathon: Hack a Road 2017. The competition aims to draw the direction of future mobility presented by Hyndai Motors Group and to offer a fancy-free variety of infotainment services and connected car applications for drivers. The winning team partook in the competition under the team name 'JALIS' and took first place honors by implementing the advanced driver-assistance system for newbie drivers. This system has been successful at monitoring traffic and advising drivers of the least-congested routes. By sending notifications of lane departure or warning drivers of an upcoming accident, the connected car could actually prepare you for what's ahead on the road. The team name 'JALIS (Just A Little Intelligent System)' is derived from an advanced A.I. system in Tony Stark's suit, 'J.A.R.V.I.S (Just A Rather Very Intelligent System)' from the movie, Iron Man. Through this development, students have expressed the ideas that the artificial intelligence system in vehicle-infotainment system and advanced driver-assistance systems will become the standard in future connected cars. With in-car assistance informing the driver about local traffic and upcoming accidents, convenient engine diagnostics, and car status updates, the connected car will soon become an integral part of the driving experience.